Here is how my crazy family works. As my brother K.C. is preparing The Great Turducken Feast of 2015, we got to planning the next feast. I had bought a bottle of saffron oil and was looking forward to making a seafood paella. Somehow we went from discussing that to prime rib. Next thing you know, we were planning the feast. There had to be shrimp cocktail, oysters, prime rib. K.C. was excited to try prime rib, he couldn't think of a time when he had eaten it before. Pops was happy about the horseradish sauce. "There is something about beef and horseradish" he kept saying. Matt can eat his weight in shrimp or beef, so this was going to be epic. A 14 pound rib roast was purchased and the plan was set into motion! We did a lot of research to pick a roasting method. It seems everyone has a different best way. I ended up going with a method from an allrecipes recipe. It was called foolproof prime rib and that seemed to describe what I needed to a t. It was reviewed over 1200 times with 5 stars, so I figured it had to be good. It involved a roasting period, a long rest in the warm oven and then another round of heat. It seemed a little crazy, but I figured if it worked for so many people it was worth a try. 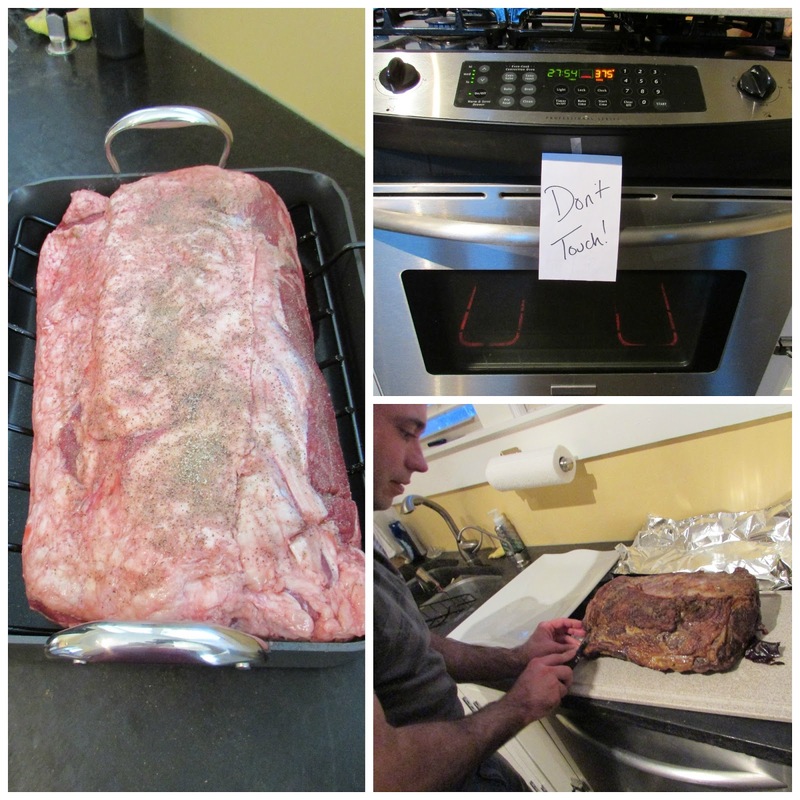 The hardest part of cooking the prime rib was mapping out what time to get it started. It was much like figuring out what time to put the turkey in the oven for Thanksgiving. Doing it isn't that hard, but the timing is everything! The prime rib needed an hour or two out of the fridge to come up to room temperature. Of course with such a feast, we had a hunk of prime rib left. The next day we got together for another round of shrimp and prime rib. We decided we should make it a daily occurrence. We left the night with a new chant. Prime rib... Every day! I made a 14 pound boneless skirt on rib roast, but supposedly these directions work for just about any size piece of prime rib providing it isn't less than 5 pounds. Be sure to check your temperatures to make sure it is cooked to your liking. Get the roast out of the refrigerator at least an hour, preferably two for a large roast, before you would like to get started. I pulled mine out at 10:00 for a 5:00 dinner. Generously coat all sides of the rib roast with salt and pepper. Place fatty side up on a rack in a roasting pan. Roast for 1 hour in the preheated oven. Turn off the oven and DO NOT OPEN THE DOOR. This was the second hardest part of making the roast, it is so tempting to peak! Let stand in the oven for 3 hours. About an hour before serving, turn the oven back on to 375 F. Cook for about 30 minutes. You want the temperature of the center of the roast to be around 145 F. Remove from oven. Remove rack and roast from pan and tent with foil for 20-30 minutes before carving. Meanwhile, prepare gravy. Squeeze the roasted garlic cloves out of the head of garlic into a small dish and mash with a fork. Mix flour in a little bit of cold stock and stir until smooth. Heat with pan drippings, rest of broth and the head of roasted garlic until bubbly and thickened. Carve beef to desired thickness and serve with potatoes and gravy! We only sliced the prime rib we ate the first night, so we had a chunk of prime rib to reheat for round two the next day. We wrapped the roast tightly in foil and placed it in the fridge overnight. The next day, I took the foil wrapped roast and placed it in a baking pan. I placed it in a 225 F oven for about an hour to take the chill off without doing much further cooking. Right before serving I turned the oven up to 375 for a bit to heat the outside again and hoped for the best. It worked! 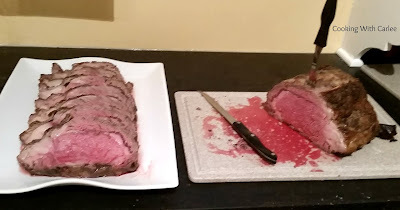 Even the outside piece was still medium-rare and the rest was still rare but heated through. It might have just been luck though. 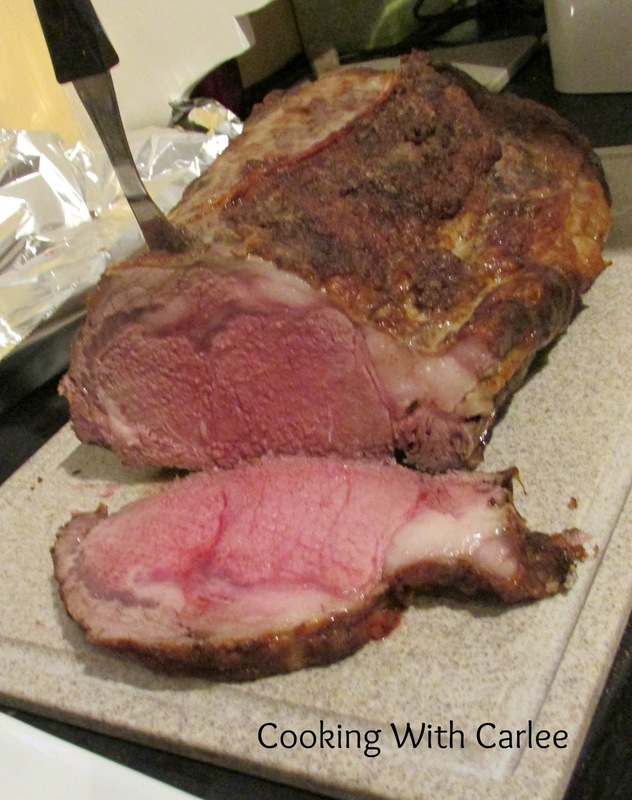 How do you reheat your prime rib? Thank you for hosting such a special party. The table was set so beautifully too. And to think I broke the prime rib every day trend by serving burgers. Oh my goodness what a feast! This looks so yummy, isn't it funny how these kinds of things come together! I hope your year and your week is off to great start! It was amazing! As we sat there talking about it, the menu kept growing. The funny thing is it didn't change much from the concept to the actual meal. So far so good, Andrea. I hope yours is going well too! What a feast it was, Carlee! I like to do research on finding the best method, too, as that's half the fun. I like your idea of reheating the meat so as not to cook it again. I'm glad it worked out for you. Both rounds were excellent! It is fun to check out all of the different ways people suggest to make something and then decide which one to go with. My brother and I went back and forth on what method to use quite a bit before we decided what to do. 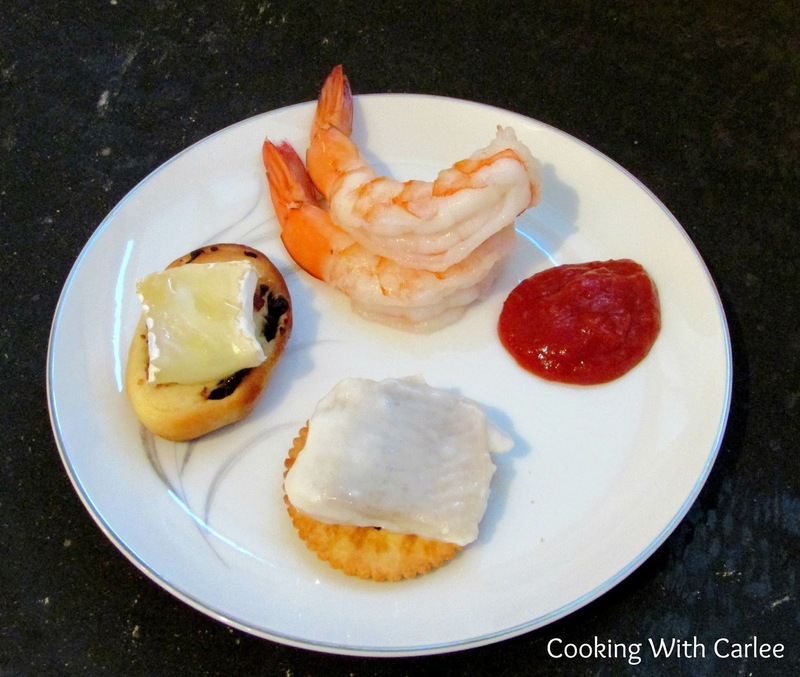 This dinner was the topic of conversation for over a week and it lived up to our expectations! My husband would have loved this! He loves Prime Rib so much! If we are having hosting a party with enough people, I will have to try this. It's too bad you guys don't live closer... we could use help eating some of these feasts! This looks fabulous! Three hour resting in the oven, huh. I may have to give it a try. I know, it sounds crazy doesn't it? It was really good though! What a wonderful meal - your pictures look delicious! 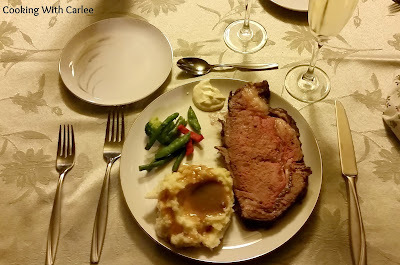 We had prime rib on Christmas as well, and used every bit of it, as I made a soup with broth from the bones! I think I will try your recipe and cooking technique next time. I bet that soup was amazing too! It was a lot of fun to have everyone over, get out the china and have a nice meal!